Sakura Cotton by Estelle is considered an aran weight yarn. It consists of 218 yards or 199 meters per 100 gram skein. It is made up of 50% cotton, 30% rayon, and 20% silk. It is a plied yarn and has a gradual colour shift, making it self striping. It comes in 6 colourways. There are currently 7 free patterns to support this yarn on Estelle's website. I knit the Triangle Shawl in the Norikura colourway. This pattern requires 2 skeins, for a total cost of $26. This is a versatile project as it can be worn as a shawl, scarf, or beach cover up. The pattern is easily extendable if you'd like to add a 3rd or even 4th skein as Kay Lynne did below. Triangle Shawl knit by Kay Lynne with 4 skeins in the Minami colourway. We currently have 5 of the six colourways in stock. 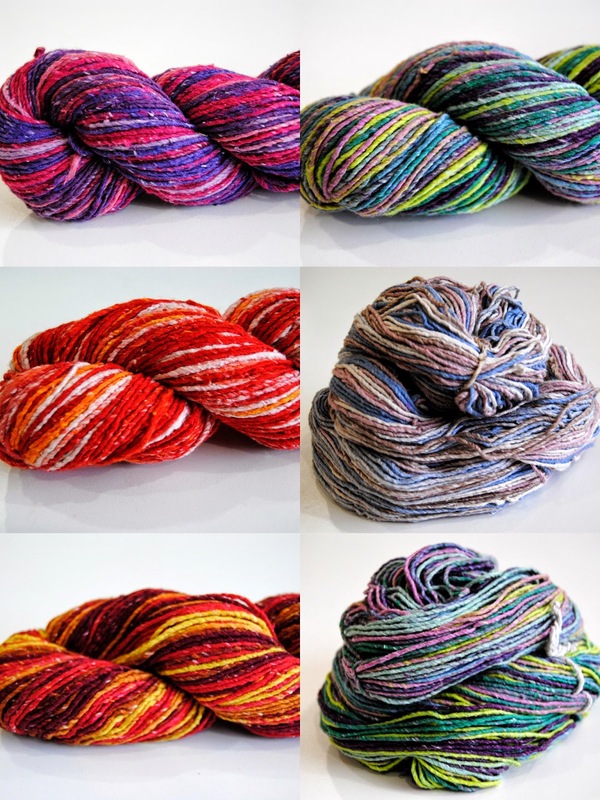 Each skein retails for $13. Come by to pick up this great yarn and knit yourself up a spring shawl!